The Obama administration intends to unleash a scorched earth campaign over the next 18 months, with a promise to “squeeze every last ounce of progress” and continue “fundamentally transforming the United States of America”. Following what some in media are calling his best week ever, the president was asked how he plans to utilize his newfound political capital. An elated Obama told the press corps “The list is long”, referring to his 2015 Unified Agenda which identifies the upcoming regulatory actions to be taken by federal bureaucracies. While the Spring 2015 Unified Agenda is markedly vague concerning most of its 3,415 regulations, clearly its overarching purpose is to enforce American compliance with an ever-expanding body of “international norms” like those required by the Trans-Pacific Partnership (TPP) and the United Nations Arms Trade Treaty. Consequently, the 2015 Unified Agenda contains a number of backdoor gun control measures designed to further restrict the possession, storage, sale and acquisition of firearms and ammunition by law-abiding citizens yet in contrast, the Obama administration intends to lessen such restrictions for non-citizens. Rule 1140-AA05 will “require a firearms purchaser’s affirmative statement of his or her state of residence”, although with states like California, New York and even Georgia providing drivers licenses to illegal aliens, a person could enter the country illegally and then purchase a gun on the same day. Generally, the importation of firearms or ammunition by non-immigrant aliens is prohibited by law. Yet the exemptions provided by 1140-AA08 would make sidestepping this prohibition as easy as being “admitted to the United States for lawful hunting or sporting purposes” or by simply filling out a permit application and affirming that one is not in the country on a non-immigrant visa. Due to Obama’s relaxation of border security and immigration enforcement, the nearly 12 million people that have crossed our borders without any type of visa have now been granted quasi-legal protections. Therefore, under 1140-AA08, this massive population is free to import arms and ammunition without any oversight after entering the country. These rules are bizarre contradictions for an administration whose effort to deny Americans their birthright to bear arms has been a political hallmark. Even before Obama began fighting gun ownership from the White House, he demonstrated unwavering opposition to an Illinois bill that affirmed a person’s right to protect against home invasion using a firearm. Likewise, Eric Holder famously called for Americans to be “brainwashed” into an anti-gun mindset (see video) and led the Justice Department as it conspired to kill the Second Amendment by exploiting the inevitable fallout from Operation Fast and Furious. While resolute in the effort to disarm Americans, the 2015 Unified Agenda is evidence that both Obama and Holder have for years been simultaneously working to grant illegal immigrants and non-citizens unprecedented access to loosely controlled firearms. To understand these otherwise inexplicable rules, they must be put in context with the policies concerning immigration and trade handed down to Obama from previous presidents. Leading up to last week’s historic vote enabling Obama to move forward with his secret trade negotiations, Senator Jeff Sessions fought vigorously in opposition, warning that approval would put the US under the authority of an unaccountable international commission similar to the floundering European Union (EU). The deal was even described as “NAFTA on Steroids” harkening back to George H.W. Bush’s trade deal with Canada and Mexico that led to a massive trade deficit for the United States and caused an unprecedented spike in illegal immigration. However, Obama’s trade and immigration policies were more directly inherited from George W. Bush who in 2005 met in Waco, Texas with Mexican president Vicente Fox and Canadian Prime Minister Paul Martin to form the Security and Prosperity Partnership of North America (SPP). Justified as a tool for “increasing and enhancing security and prosperity in the United States, Canada, and Mexico”, the main purpose of the SPP is “eliminating barriers to labor and capital flows across national borders”. Predating the United Nations and the EU, the formation of a unified American megastate became official US policy in 1948 with the creation of the Organization of American States (OAS). Every US president since Harry Truman has appointed an ambassador to the United States Permanent Mission to the Organization of American States whose stated principles include collective security, consolidation of government, fulfillment of obligations to the UN Charter, and effective limitation of conventional weapons. As with the European Union, a transnational union of the Western Hemisphere will require incredibly draconian and homogeneous gun laws in order to limit conventional weapons in the hands of non-state parties. The CIFTA treaty, drafted by the OAS and sponsored by Barack Obama, defines “Illicit Manufacturing” as “the manufacture or assembly of firearms, ammunition, explosives, and other related material” “without a license from a competent governmental authority of the State Party”. This provision would thereby require a federal license for literally every American gun owner that assembles a weapon after breaking it down for cleaning, in addition to requiring separate licenses for those that reload ammunition. As the “unrestricted flow of labor and capital” ultimately mandates that all laws be standardized across the former nations that comprise a transnational union; Second Amendment activists, as well as citizens that are opposed to Obamacare, the threats to private property rights, global taxation without representation (also see here) and the Texans that have been fighting the Trans-Texas Corridor (a.k.a. the Port to Plains Corridor) would do well to recognize that they all share a common enemy and find ways to coordinate their efforts accordingly. What If Our Republic Is Already Dead? “Dystopia” DHS Wargame for Jade Helm in Texas? Wargaming has been a tool for military planners throughout recorded history, and for decades, militaries have used computer technology to make simulated exercises more complex and fruitful. More recently, the US Department of Homeland Security developed their own wargames with help from the Department of Defense. One of these tools, first released in 2009, is called Dystopia: Where Bad Things Happen. 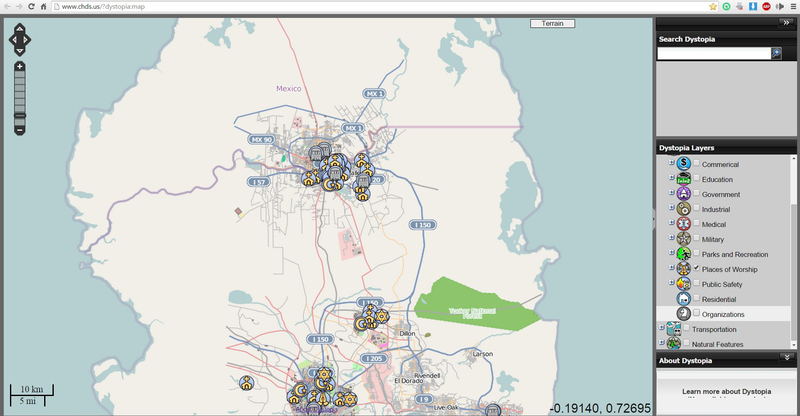 The toolset is a “…collection of geospecific and meta data…” including a detailed map, which functions like Google Earth, and a Wiki-type encyclopedia called Dystopedia. 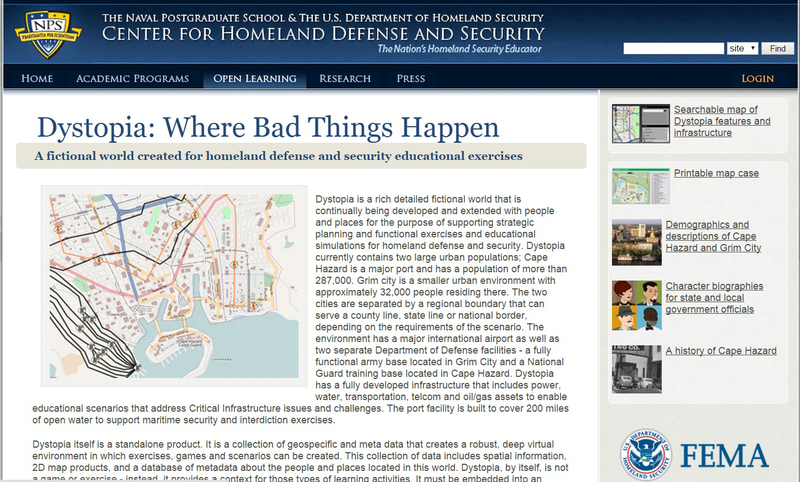 Dystopia gives the DHS Center for Homeland Defense and Security the means to practice real-world actions with a wide range of information including in-depth intelligence about private individuals and organizations such as churches and Boys and Girls Clubs. The overview states that Dystopia “…is continually being developed and extended with people and places…” although from December of 2014 until this week, the only noticeable change has been the addition of cemeteries. However, the territory on one side of this supposedly generic boundary is labeled Mexico and with that information, it becomes clear that the other side is almost certainly Texas. For instance, the two major urban areas, separated by a border, are called Diablo Valley and Nuevo Diablo; which could represent the two major cities of the Rio Grande Valley, Laredo and Nuevo Laredo. The Texas side of the map also has a major port city. This city has a U.S. Coast Guard station, several embassies and every oil pipeline on the map leads to the refineries found there. It takes no stretch of the imagination to see this as Houston. The coastline also has geographically significant barrier islands, just as Texas does. The US side of the map is incredibly more detailed than the Mexican side, which has few strategically important features aside from power plants and a military base. However, on the other side of the border one can spend hours sifting through categorized layers of information. In addition to utilities, zoning districts and transportation routes, the locations of apartment complexes and civic organizations are also pinpointed. Even organizations that seem unrelated to DHS functions are marked, such as the local chapter of the Hell’s Angels, the West Side Chess Club. Of course, no domestic training scenario would complete without a contingent of white supremacists; and in Dystopia, the supremacists have a rural compound, which the DHS classifies, as a “house of worship”. By itself, the Dystopia tool raises many questions, especially given the failure of the DHS to control our southern border. Yet taken in context with the upcoming Jade Helm exercise, the plans for which pre-date 2013, Texans should demand answers from the DHS. How long have they been training for dystopia in Texas? What scenarios are they preparing for, and what plans do they intend to execute? Concerning this website, I hope to soon have time to add many, if not all of my articles from the past two years to this site. Some will have pictures where it’s important for communicating the facts but some will not because of time constraints. Keep your powder dry and your provisions well stocked. 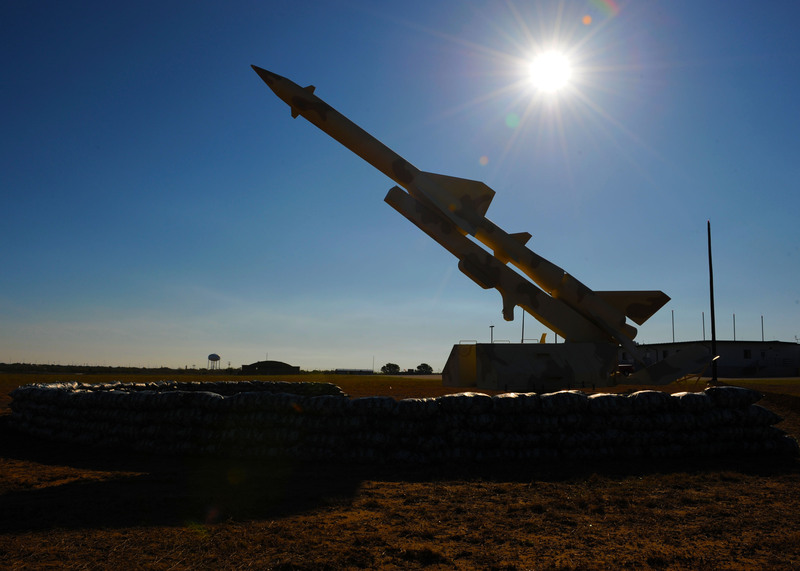 In the past week, Youtube and certain alternative media sites have exploded with reports of a “new” surface-to-air missile site in Texas. The “journalists” insinuate this is proof that the Jade Helm 15 exercise is actually cover for a military buildup in preparation for an impending war against hordes of ISIS fighters streaming out of Mexico. Quite simply, this could not be further from the truth. I happen to know Travis Kuenstler, the man that took the photos, and have confirmed that this site is in fact the Snyder Electronic Scoring Site (ESS). More specifically, this site serves as a training tool for the 7th Bomb Wing, 12th Air Combat Command at Dyess Air Force Base in Abilene, Texas which includes the B-1 Bomber and the B-52 Stratofortress. The site is 7 miles north of Fluvanna, Texas on the left-hand side of Farm to Market Road 1269. 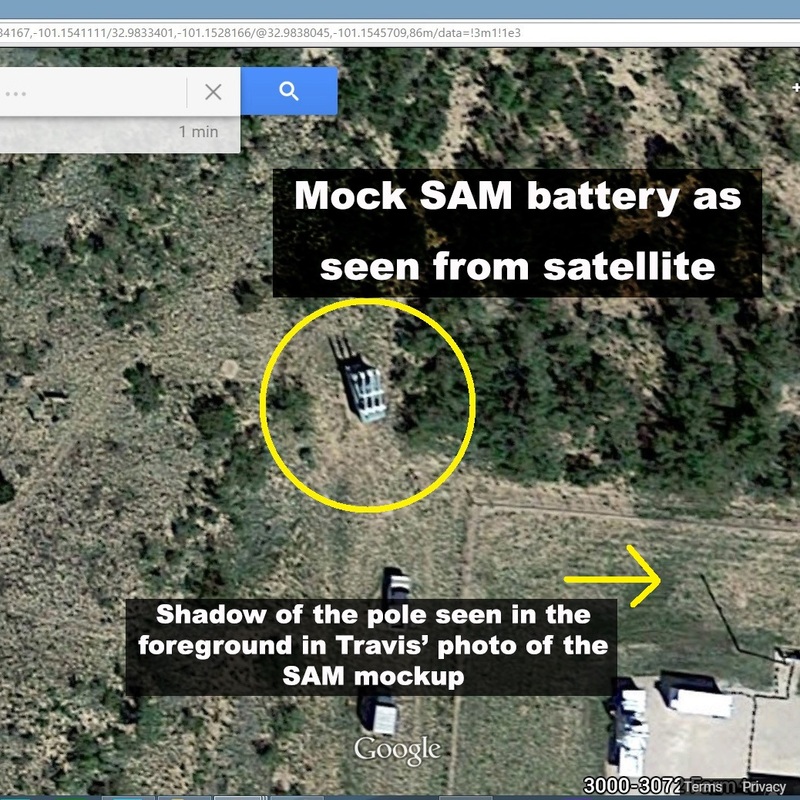 One can also view satellite images of the site on Google Maps at 32°59’00.3″N 101°09’14.8″W. 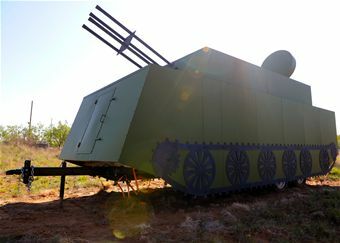 In addition to the electronic warfare threat simulators, the site has mock-up targets with heat sources the aircrews use to test on-board sniper pod equipment. 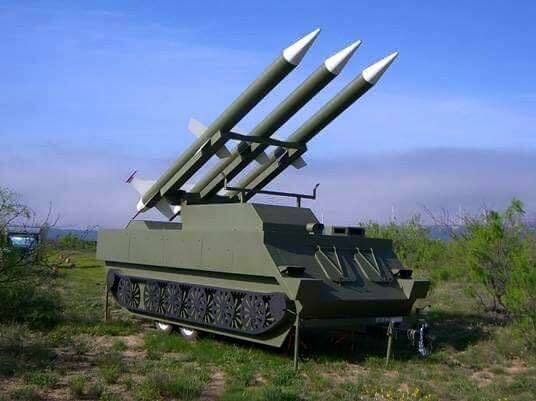 Mock-up targets such as SA-2 Surface-to-Air Missiles and 2S6 M Self Propelled Air Defense Vehicles are scattered throughout the main facility and remote locations. 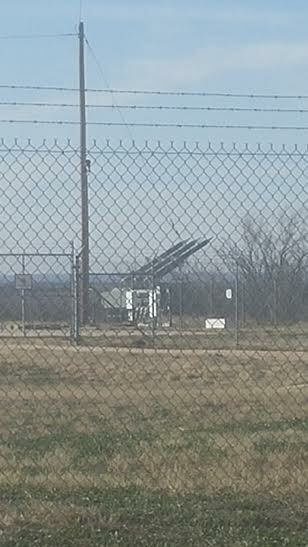 Nearby Winston Field outside of Snyder, Texas is also part of the greater electronic scoring complex and in 2013 served as a site for ‘simulated airport seizure’ in an exercise that included bombers, transport and attack aircraft. 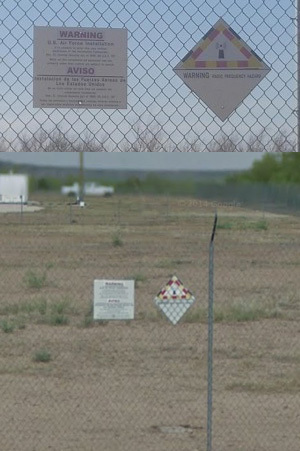 According the 2007 Department of Defense Base Structure Report, there is also an ESS located in Pecos, Texas in addition to the site outside of Snyder. 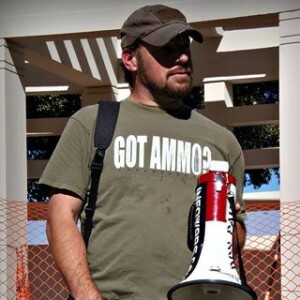 As a member of the Texas Liberty Movement, I am certainly concerned about the Jade Helm 15 exercise and share the sentiments of Kimberly York, Regional Coordinator for the Texas Nationalist Movement who spoke to the Big Spring City Council condemning their decision to host the Jade Helm 15 exercise without consulting nor deferring to residents. 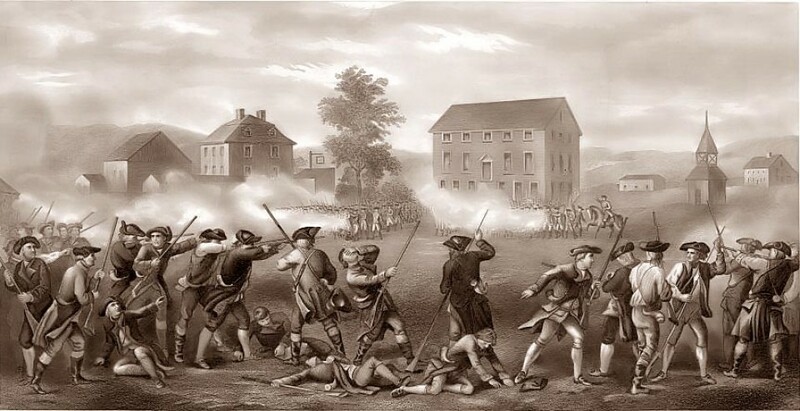 Speaking privately, she voiced legitimate concern that property owners in the area may inadvertently fire upon participating troops as they conduct armed maneuvers in the dead of night. Over the past decades, the wanton refusal of the mainstream press to conduct true journalistic investigations into government action has created an explosion in citizen-journalism; unfortunately, not all members of the “alternative-media” demonstrate the discipline that should be demanded from news sources. An unwillingness to do research or report factually will only serve to discredit the new press and further disenfranchise the societies that have been betrayed by traditional news sources. In addition, given the suspicion surrounding the Jade Helm exercise and the potentially dangerous reaction that such tension might provoke, it is vitally important that we not allow ourselves to be overcome to the point that we fall victim to the careless fame-seekers that are hawking salacious half-truths to the detriment of their own readers. At a time when the entirety of Western civilization is focused on eliminating police corruption and ending the suffering that unlawful police departments inflict upon citizens, a Texas State Representative, Jason Villalba (R-Dallas), is ramping up his crusade against civil liberties, seeking to diminish public oversight of police action. thereby criminalizing basic rights enumerated in the first and second amendments to the US Constitution. Villalba, a Republican, has included language in the bill that provides an exception for government-defined “members of the press”, mimicking the failed attempt by California Democrat Diane Feinstein to curtail free speech with her amendment to the 2013 Free Flow of Information Act. Activists within the Texas Liberty Movement indicate that Viallba’s bill will be opposed in the House although no legislators have gone on record to confirm this yet. Critics of the bill say that it is a continuance of a frightening trend in government to criminalize lawful behavior, limit human rights and eliminate citizen oversight. The bill stands in marked contrast to the efforts made by Texas citizens, including police andlawmakers, to increase oversight of police actions through the use of body cameras and other measures. Similar initiatives, put forth on the national level, have received nearly universal support in the wake of Ferguson and other highly publicized incidents involving police shootings. Like Feinstein, Villalba would have the legislature ignore the ways in which technology has enabled journalism to evolve, narrowly defining “journalist” in such a way that would criminalize the work done by many of today’s most powerful and influential members of press. Sadly, these attempted end-runs around the First Amendment are far from isolated occurrences. Over the past decade a multitude of evidence has surfaced that reveals an increasing animosity towards the press on the part of government, though this animosity has not gone unchecked. The last right we shall mention regards the freedom of the press. The importance of this consists, besides the advancement of truth, science, morality, and arts in general, in its diffusion of liberal sentiments on the administration of Government, its ready communication of thoughts between subjects, and its consequential promotion of union among them, whereby oppressive officers are shamed or intimidated into more honorable and just modes of conducting affairs. Americans have long cherished the right to a free press and rightfully so. 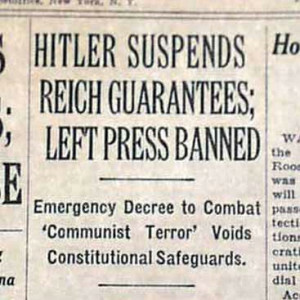 Efforts by those in government to flout this basic premise of our constitutional republic clearly recalls the Nazi’s Reichstag Fire Decree; which, in 1933 made criticism of the government a criminal offense in Germany and paved the way for the terror of national socialism. But what terrorizes minions of big government, like Jason Villalba, is a free people exercising their natural rights unimpeded by regulation. 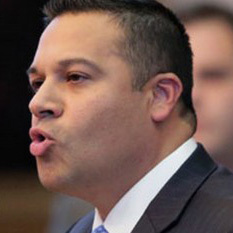 Another highly publicized bill filed by Villalba this session, under the guise of protecting religious liberty, would amend the Texas constitution to allow state and local governments to “burden” a person’s free exercise of religion if “the burden is necessary to further a compelling governmental interest…” Villlalba has since folded under the pressure coming from both sides of the issue and withdrawn support for his own bill leaving Representative Matt Krause (R-Fort Worth) to pick up the slack. Take note Villalba, that’s the way real Texans think. 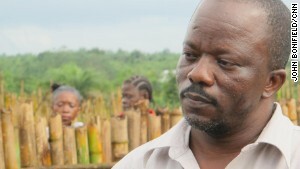 Desperation and hope led Liberian doctor Gorbee Logan to treat a fellow healthcare worker for Ebola using Lamivudine, a drug used for treating HIV and hepatitis B. Over the next two days the patient showed remarkable improvement and ultimately survived. As of October 3rd, Dr. Logan had used the drug on at least 15 others, saving 13 of them. That’s a survival rate of 86.6%, a miraculous contrast to the 70% fatality rate observed during this year’s Ebola outbreak. Dr. Logan wasn’t taking a stab in the dark but rather capitalizing on research that was reported as early as 2001. Thirteen years ago Reuters reported on a medical discovery that found both Ebola and HIV/AIDS use the same mechanisms to spread throughout the human body. WASHINGTON (Reuters) – December 1, 2001 – The viruses that cause AIDS and Ebola, two deadly, contagious and highly feared diseases, spread through the body using the same mechanism, U.S.-based researchers said on Friday. The researchers, led by Dr. Paul Bieniasz of the Aaron Diamond AIDS Research Center at New York’s Rockefeller University, said they hoped their finding might lead to the discovery of new drugs to help treat HIV and Ebola infections. Evidently, that discovery did lead to the creation of new drugs that could be deployed to fight the most deadly and widespread Ebola epidemic in history; but the western medical community has done nothing to make that happen. Instead, over the past few months we’ve seen scores of interviews with doctors and researchers that ignored existing treatment options and instead focused on non-existent vaccines as if there were no other possible medical response. Each of these experts offered excuses and explanations for why there is no Ebola vaccine including a man credited with discovering the pathogen, Peter Piot, a Belgian microbiologist. Dr. Piot’s statement was a lie, and he knew it. Although medical experts tell us that there is no definite cure for Ebola, nearly everyone on the planet has now heard of ZMAPP. This experimental bio-pharmaceutical set a historic precedent this year, credited with saving the lives of western doctors that had become infected with Ebola while serving in Africa. As their colleagues struggled to save their lives, virtually all of the ensuing drama was broadcast live, all over the world. Mr. Piot’s career essentially began with the discovery of Ebola, one of the most feared pathogens in existence, yet we’re supposed to believe that he didn’t notice this historic development? Professor John Ashton, president of the UK Faculty of Public Health blames the lack of an Ebola vaccine on Big Pharma’s disregard for impoverished Africans. For whatever reason, Piot’s interview on CNN ignored vital and pertinent information that has resulted from decades of Ebola research. Assuming that was the intent, the only other “success” that can be attributed to the interview is that it fostered apathy towards the horrific deaths of thousands of African people. In an article published by British newspaper The Independent, Professor John Ashton, president of the UK Faculty of Public Health (the British counterpart to our CDC), blames the failure to find an Ebola vaccine on the “moral bankruptcy” of the pharmaceutical industry. He reasons that the refusal to invest in an Ebola vaccine is due to the fact that, until last month, it only affected people in Africa. “In both cases [Aids and Ebola], it seems that the involvement of powerless minority groups has contributed to a tardiness of response and a failure to mobilise an adequately resourced international medical response. So maybe this Dr. Peter Piot is simply a despicable racist that has no interest in actually combating Ebola because its only an “African problem”. Though even if that were the case, its uncharacteristic of a scientist to wittingly appear to be ignorant. It’s widelyrecognized science is a very ego-driven pursuit, especially for researchers that are the “rock stars” of their fields. When Dr. Bieniasz published the connection between AIDS and Ebola more than a decade ago, Peter Piot should have found himself in a unique position to lead the scientific community in the eradication of both AIDS and Ebola; thus earning for himself a most enviable position in the annals of science. One can hardly imagine that Dr. Piot would gain so much pleasure from the deaths of Africans that he would willingly forgo such an opportunity, yet he’s obviously aware of a possible treatment for Ebola, while simultaneously keeping it secret from the unwashed masses that get their news from CNN. Perhaps there’s a touch of classism in Piot’s feigning ignorance about Ebola treatments. Or maybe he’s an ignorant and unmotivated has-been. Perhaps he attained his only real achievement in the 1970’s, by being in the right place at the right time; and now he just peddles his name to agenda-driven editors and producers so that he can earn a little pocket money. Dr. Peter Piot, who helped discover Ebola in 1976, told CNN Money that there are no known treatments for Ebola on the same week that he praised ZMapp in an interview with The Independent. It could be that Dr. Piot just doesn’t give a damn about fighting Ebola, or AIDS for that matter, regardless of who it affects; and it’s possible that his deliberate effort to hide scientific breakthroughs is the product of something more sinister. None of this would really matter if Dr. Peter Piot was, in fact, a washed-up quack. Unfortunately, that’s not the case. Peter Piot is presently the director of the London School of Hygiene and Tropical Medicine , in 2009-2010 he was the Director of the Institute for Global Health at Imperial College, London and is a former President of the International AIDS Society. Piot was also the founding Executive Director of UNAIDS and served as Associate Director of the Global Programme on AIDS for the World Health Organization. He was even Under Secretary-General of the United Nations from 1995 until 2008. His bio states: “Under his leadership UNAIDS became the chief advocate for worldwide action against AIDS.” Obviously, a discovery that identified an essential link between the treatment of both AIDS and Ebola should not be a forgotten bit of trivia for this man. Although he’s a physician that is relied upon by millions to safeguard public health, he obviously has an agenda that is incongruent with the duty that he’s been entrusted to fulfill. When a person of this magnitude goes on international television and spreads such malicious disinformation we should be able to rely on the press and our leaders in government to call him out and discredit him – but they wont. Regardless of what Dr. Piot and the United Nations has either done or refused to do regarding Ebola, Barack Obama declared last week that the “…United States will continue to help lead the global response…” to the scourge. (emphasis added) Since the discovery of the disease in 1976 the United States has been a central figure in the Ebola story. If we, as Americans, intend to undertake a sincere and critical analysis of the history of Ebola and the efforts to destroy it, then we should rightly begin by examining our own government’s role in the saga. In the past 24 hours, at least four patients have been admitted for signs of Ebola only to be cleared within hours after being screened by questioning. Yesterday a patient at Baptist St. Anthony’s Hospital in Amarillo was admitted with signs of Ebola and reported having been in contact with a person that had recently returned from an area in Africa where the Ebola outbreak is occurring. The patient was isolated along with the triage nurse that assessed the unidentified patient. 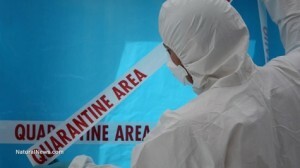 According to local news reports the patient responded that he or she had been in contact with a person who had traveled recently to the Ebola stricken region but unidentified “officials” claim that the person had not traveled to any of the four affected West African countries in the past 21 days. Due to this assertion the patient and the nurse were released from isolation. Unfortunately, it must be recognized that Ebola has now been contracted in Texas as well as in Africa and experts expect it to occur again. In Midland, Texas two patients were similarlycleared last night without medical testing. “The state did not deem them as possible cases based on the history and the signs and symptoms, and no test was authorized,” according to Val Sparks, Inspection Preventionist for Midland Memorial Hospital. According to the interviewer that spoke with Val Sparks, testing for Ebola can only be done by the State Health Department in Austin. This revelation is especially troubling for area residents because another possible Ebola patient in Midland was said to have been cleared by medical testing although the tests were done locally. That patient was removed from a commercial airline flight after it made an emergency landing at Midland International Airport last week. 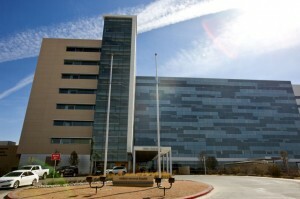 The patient was held at Midland Memorial Hospital for 24 hours. A spokesman for University Medical Center (UMC) in Lubbock, Texas told reporters that it takes two days for conclusive Ebola test results. 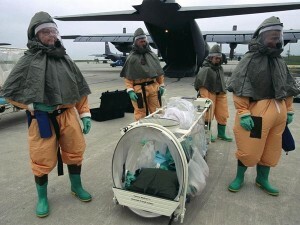 That city recently deployed hazmat crews to transport a possible Ebola victim from their residence to University Medical Center. 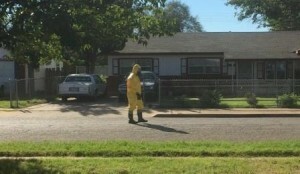 Lubbock police confirmed the man had recently traveled to the Ivory Coast in Africa. Lubbock EMS Director Chris Teague said there were other people present in the house where the patient was found. While they were all said to have been “attended to according to protocol” the hospital spokesman revealed that the state will not be testing any of them for Ebola. According to a local news report “Early Thursday afternoon, medical personnel were handing out masks at the emergency room entrance to UMC. (EMS Director) Teague said the masks were in response to “flu-like symptoms” exhibited by a patient, but that the situation had been cleared. Teague could not confirm if the two patients were the same person. Since the Ebola outbreak in Texas began, each day has brought confirmation that individuals must be prepared to rely upon their own knowledge and preparedness in order to keep themselves and their families safe. Last week First Presbyterian Hospital in Dallas blamed a flaw in their Electronic Health Records (EHR) system for the oversight that led to the discharge of Thomas Duncan, exposing countless individuals to the Ebola virus. However, an internal email obtained from a staff member at First Presbyterian tells a different story. This comes after a Dallas paramedic denounced the hospital for telling the public that they had been quarantined after transporting Duncan to the hospital and that the ambulance they used was taken out of service. Before returning to the hospital on the 28th Eric Duncan vomited “all over the place” outside his apartment. 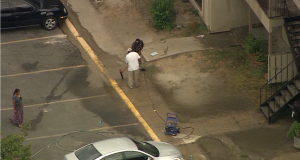 The vomit remained on the sidewalk until four days later when a news helicopter captured footage of unprotected maintenance workers pressure washing the vomit as residents strolled by. A previous internal email at First Presbyterian confirms that the CDC is directing the response to the first case of Ebola diagnosed on American soil which begs the question: what did CDC Director Frieden mean when he told the nation that the situation in Dallas was “under control”? Did they order First Presbyterian to lie to the American people and the people of Texas? Were all of these shameful failures part of the plan?